Fourth Street in Long Beach, also known as Retro Row, houses some of the city's most unique stores and restaurants. Even from just the outside, it is easy to see that Meow, a vintage clothing shop, easily fits in with the theme of the street. While the outside instantly reminds you of the clothing stores of yesteryear, the inside completely transports you back in time to the 1950s. From the moment you first cross the threshold, every corner of the store reminds you of a time long gone. 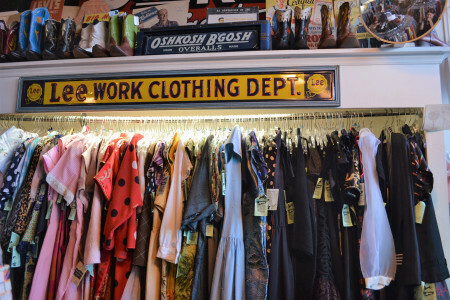 From its vintage neon signs to the retro diner seats near the shoe corner and the dressing room doors fashioned like old refrigerator doors, Meow provides the perfect environment for one to look through their impressive collection of vintage fashions. In order to find some of the most unique clothing finds in LB, one simply has to look inside of Meow. Meow, located at 2210 E 4th St., has been in business for 31 years all thanks to the work of its owner and vintage connoisseur Kathleen Schaaf. Specializing in deadstock (never worn with original tags) merchandise from the 1940s to the 1980s, Meow has supplied clothing to a number of different television shows and movies—from classics like Seinfeld and That '70s Show to modern hits like Stranger Things and 2017's re-telling of It. Aside from its impressive collection of clothing and accessories and its retro decor, Meow has been able to reach these heights because of the care and attention provided by Schaaf, who one can still find working inside the store constantly updating its stock. No one starts off at this level and Schaaf was no different. "I've been buying and selling vintage for a while and then this spot opened and it just kind of happened. It took me 20 years to build it up to what it is now," said Schaaf. One of the reasons that so many people flock to Meow in order to find those one-of-a-kind pieces is because, unlike some other consignment and vintage stores, the stock is meticulously kept organized and presentable by its staff. If you are in need of a perfect rayon polka dot skirt or a poly-cotton blend sweater, then it is as easy as heading over to its designated rack. This store is not like your local mall. If something is not in your size, you cannot simply ask for another size to be ordered for you. However, that is also the basis of its appeal; each piece you find feels like something that was made for you and only you. Employee and Meow frequenter, Zena Palacio, sums it up perfectly when she said, "It's the history [the clothes] contain. The different types of clothing available. It's the wacky items you can come out with." The finds here inspired Palacio, who recalls coming to the store with her mother and counts a "sailor dress bought with my own money" as her call to begin working at Meow. Through her work, Palacio has been able to "interact with the people who come in and end up making friends with them." It is this family-like atmosphere that truly brings this already amazing store from just being another store on Yelp to a place that brings people back year after year. If you find yourself in Long Beach, please head over to Meow on Fourth Street and check out what the hype is all about. In addition, do yourself a favor and check out the other stores as well on Retro Row. You will definitely not regret it. Open M-F 12-7 p.m.; Sat 11-7 p.m.; Sun 12-6 p.m.